I‘m trying to get my house headed in the right direction. I think things might be finally starting to come together a little bit in my mind. In order to get myself inspired, I spent some time last night searching through some images of a few details in cottage bathrooms that I like. It is tricky deciding what direction to go — for me it is a combination of finding the right inspiration pictures and deciding how to best work with what I already have. There are so many things I take into account before I get started on a project! I wish I was a decisive person who could make decisions quickly and easily! But, I’m not very decisive, at least until I get going in the right direction. Then things seem to come together quickly. My lack of decisiveness might be because I don’t have endless funds. It is easier to be decisive when you can do whatever you want and money is never the issue. I like to work with what I have as much as possible, and it can take time to come up with the best ideas. It is also easier to be decisive if you have a live-in handy man or the desire to become a handy woman. Neither of those are true for me. 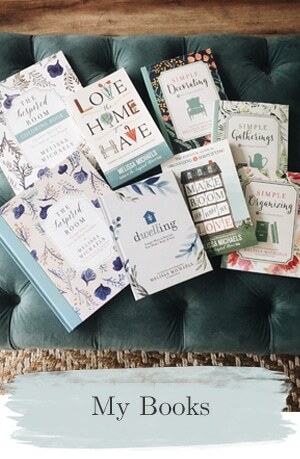 Of course, it is also difficult to be decisive about your direction when you happen to love so many different options (and your husband likes to weigh in with his opinions too! ), how can one ever decide? But, I am getting very excited about finally feeling at home in my house. 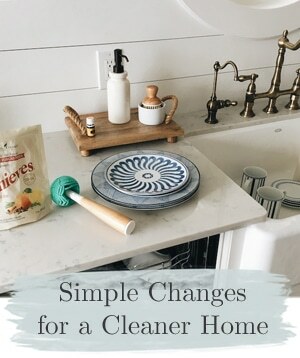 I should have clarified one point in my 2011 home goals…and that is not only do I want to make our home work for us, but I want to make it FEEL like us. I want it to feel like home. I miss so many details from all of my old houses. I’m convinced I can make this new house feel more like home by adding a few of my favorite elements from the past and combining them in a new way for this house. It will take some more time, but I think I can do it. I just have to be clever, creative, patient and inspired. I’m working on all of the above. Once I get going, watch out! I’ll be on a roll. I remember this feeling when I was making decisions for my kitchen remodel at my old house. It took me about a year to finalize plans for that kitchen, but in the end, I loved it. I’m hoping that in spite of lack of funds this time (darn that lack of money), I can transform this house. I think I might be starting to feel a little inspired. In fact, I think I’m about to start rolling. Kind of. I just have a few more things to decide first. Then I’ll roll. I’ll share about one of my next projects later this weekend! Are you impulsive when it comes to home projects? Or do you take your time to mull things over? I’m usually impulsive. If I think things out too much, the makeover loses much of its fun! Well you must have a great handle on the direction you are going at your house! Then it is really fun to be impulsive! I cannot get to that point in this house. Knowing where you are going makes impulsiveness a very good thing! Until then, being patient is probably safer! Thanks Melissa for the great images – you’ve done my research for me! I’m on the bathroom itch as well so you’re post in going in my favorites for reference. I normally like to mull over projects, but as soon as I have an idea of what I want, I instantly become impulsive. Me too, that is how it goes!! Once I decide, I want it done TODAY. 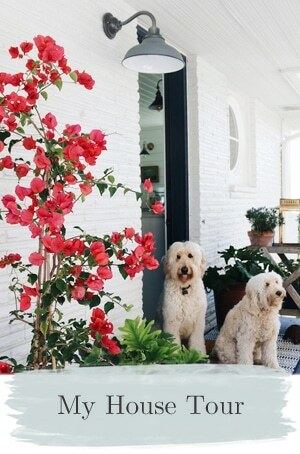 Love these pics from Coastal Living, thanks for sharing them. I think it takes time to do a good home project, even if money wasn’t an issue, it just takes me time to figure out what I want and then find that in the marketplace. Take your time, it will feel like home in no time! I love the pics – I could stare all day long. It was a long time coming for our bathroom. We can’t afford to be impulsive, so we have everything thought out usually before we have the budget saved up to actually do it. I know it probably all feels like forever to you, as it did for me when we were in the midst of our projects. You’ll get there though and it will be worth all of the decision making and waiting and work. Yes, I agree Em! Patience pays off. I’m like you – indecisive. It takes me forever to decide what to do and then even to get it accomplished. Funny how life can get in the way. I love having a project done though! I’m a muller–excessively analytical. So I do things in little stages: experiment with small changes, do a little painting and reorganizing–see if I like it. So many things look good in pictures or seem like good ideas, but they aren’t practical for real living. It’s a process. Agreed, it is a process. Especially for those of us who love to have our homes FEEL right. Good ideas are easy to come by, but the right ideas usually take a little more time! I’m both. I mull over things forever, mostly due to the anemic bank account, but I’m impulsive with some things, too – specifically demolition which takes no funds. I’ve been known to pull out the sawzall when my husband is out sledding with the boys. I make quick decisions. I purchased our last couch in 5 minutes. I walked into the warehouse, glanced around, saw one I loved and bought it. Still love it. I, too, love making a home that feels like us. It is a noble and fun goal. All the best on your bathroom project. I unfortunately take waaaaaayyyyyy to much time to mull things over. It is ususally becuase I won’t just go with my gut and do it. I miss Cottage Living. Can someone PLEASE bring that magazine back? I’m an endless “muller”… I’m in the same boat as you, Melissa, with limited funds, so every decision has to be thought through. I will admit though, that once I make a decision it’s no holds barred! You’ve got some fabulous inspiration in this post and you’re so creative– can’t wait to see what you come up with! 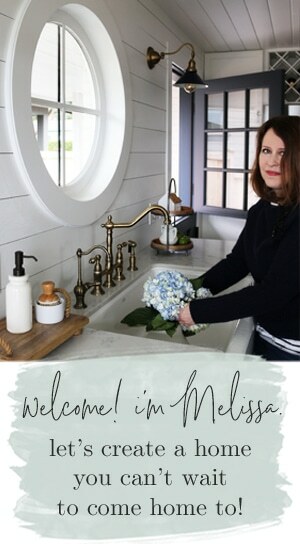 Melissa I absolutely love this post because I am feeling much the same way….we moved last July, and I’ve been remodeling ever since and trying to make this perfectly nice house FEEL like our home. Ahhhhh, the old budget does like to interfere with this agenda, yes, but we’re getting there. The master bath and kid’s bathroom still need to be painted & updated so I really enjoyed the beautiful images you shared. 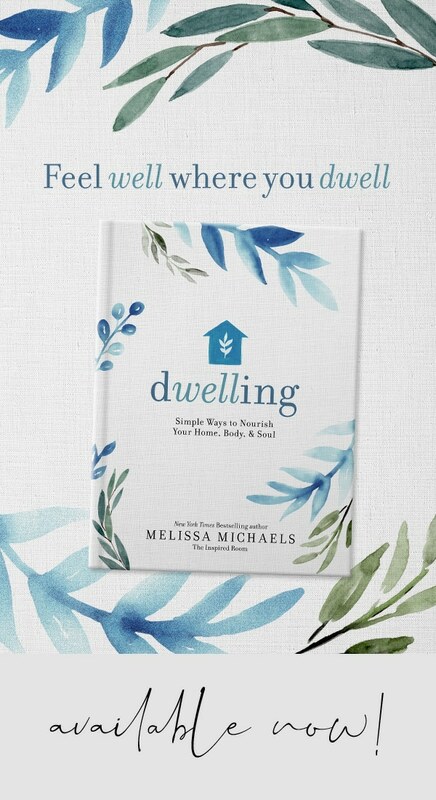 Your home is so lovely with all of your touches and I’m sure you’ll reach your goal this year! Oh man…these photos sure are inspirational! I can come up with the ideas pretty fast, but it takes awhile to get things accomplished for the same reason as you…lack of funds. It does make it all the sweeter when we do get our projects done, though, from having to wait and dream and plan…. I love the wallpaper in the last photo! I have to wonder though if wallpaper in a bathroom would get steamed off with the showers? Probably perfect for a powder room though. Yeah, wallpaper in a main bathroom with a shower would be a little risky! Powder rooms are great for wallpaper! I mull things over for sure. I too have a lack of funds and know I would do things differently with a big budget! No, not impulsive. But once I know what I want, the deal is done, the decision made. I’m big on tearing inspiration out of magazines, etc. I like to go back and refer to them over time. I’ve noticed that sometimes I am not as keen on something as I once was. But it is interesting that many —many— style elements remain my favorite. Me too, I tend to have fairly constant taste with my basic style although anything that was at all trendy definitely sticks out to me a few years later. Good thing I avoid most of the trends! I completely, completely agree! I’m a SUPER slow decision maker, but I didn’t realize it until after I had purchased a bunch of things and their “returnable window” closed. So now, I’m stuck with a bunch of things I bought on a whim and I truly loved on their own, but when I put them all together, I wasn’t as happy with the result. But now I know and I’m learning to take my time with decisions – and keep reading blogs like yours to give me inspiration and ideas to mull over! Thanks! That is such a good point, if we don’t at least have a plan to begin with, being impulsive can lead to mistakes we regret! Even if we like what we bought, they can be wrong as a whole! 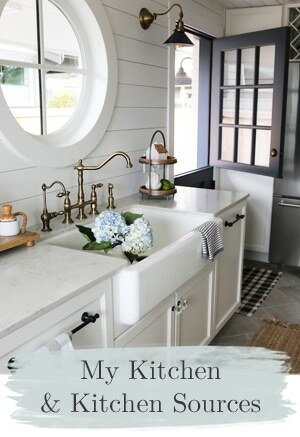 we’re starting the hall bath reno next and you have shown my top 2 inspiration pics from coastal living. Love me some CL pics! Great post. My hubby is the slow decision maker in our house – I tend to know what I like when I see it, and I love your blog (I just found it today!). I love all the pictures! I definitely take my time. But in the end I am ALWAYS glad I did because then I’m truly happy with what I accomplished. And like you I have to deal with lack of funds, and lack of handyman. I LOOOOOOVE the white wainscotting in these photos though. I definitely lean that direction. I have been trying to figure out how to do it in my kitchen. Well, from those inspiration pictures, we know one thing for sure- you’ll need a pedestal sink! And an element of white. I’m a renter, so I can’t do anything to my house beyond paint. I wouldn’t say that I’m impulsive, but I make decisions in an instant I can usually see them through. Good luck with the project! I mull, it takes me forever even to hang pictures. They sometimes can stay staged on the floor for a week! I’m both. I take my time finding what I like then when I know what I like I jump. Well, as much as my budget allows!I’m more of a quick decision maker most times though. Love these…great style! And, we love following an impulsive plan. Know what you want and be prepare, but go for it. Best wishes for a lovely weekend. I am so inspired by these beautiful bathrooms! I love the first one and the one with the turquoise table as a vanity. I need to paint my current vanity and update the hardware, because that’s all we can afford. Right know it’s a soft faded pink, but our bathroom is beach tones of blue and sandy tan. It clashes so much. But these have awesome ideas for where to place towel racks – how adorable are those ropes under the windows?! I could see myself living in each of the baths shared….. I go back and forth all the time about ideas for projects I’m doing….so I feel your pain. I can never find just what I was thinking of…or it is way out of my budget range. Your place always looks divine. You’ll do great things to your home, I sure, because all of your ideas are great. I love the new font for the title of each post. UGH, I am both. At first I will mull over details, and then once the project starts I become impulsive with changes. Hence the gutting and remodel of our kitchen while I was pregnant with my first born. 8 months pregnant, preterm labor and making impulsive decisions. I absolutely love the last photo, but know I would never have the guts to hang that wallpaper. I may have snorted a little… are you serious? Impulsive all the way, why else would I decide to paint all of my upstairs woodwork on a whim (cra-zay). And those photos are gorgeous, and quite possibly may have triggered another impulsive project. My husband will thank you later. I take for-ev-er to make decisions about decorating. Mostly because I don’t like to make large purchases without a lot of thought and since I haven’t been out on my own very long, my decorating tends to include “major decision” type purchases (like couches and tables and desks). Things that I want to last and be as versatile as possible! But, even though I’m indecisive at first, once I make a decisions, I end up really pleased with them! Love all of these photos. We just purchased a “new” 80 year old brick cottage. Next on the agenda is the basement bathroom. These photos are helping me make some decisions. I tend to plan things out and really think about the details. Love your blog! I hadn’t realized that was what was a cottage bathroom… in that case, I really like it. I have a basic theme for our house… and I’m pretty impulsive. But the impulsive part seems to be in the tearing down, our kitchen is still 1/2 done. Life happens. Definitely in the indecisive camp. I think part of it comes from my perfectionism. I want things to be just right…I don’t want to make a poor decision…I don’t have a lot of money so whatever I decide I will have to live with for a very long time…etc. My other problem is that often I know what I want in my head, but I just can’t find it! It takes me forever to decide to and then when I do decide like you it’s a lack of money and I try to use what I have or when I find things at the thrift stores that I think would be neat I buy those. At the moment I have mirrors running out my ears! LOL I have several in the attic and a few here and there in the house. I did our master bedroom in a beach theme and have got to do the master bath now. So maybe I can get some inspiration from you on this one. Our bedroom is like a sky blue with white trim and I wanted the bath to match it a little anyway. I’ve got to take the wall paper off the walls in there before I can do anything. I hope you get yours all together soon so you can work on another area! I’m like you – take a long time to make the decision and then love what I finally decided to do! Funds are the big part of it for me. I have a handy-man-sweetie but he is working so many long hours right now that I don’t have the heart to ask for much in that department until he has a day off or gets excited about what I’m doing. He’s the best and I’m blessed. Think I need to learn to do a few simple things myself! Can’t wait to see your next project! I definitely suffer from Analysis Paralysis. I overthink to the point where I don’t get things done. I think I’m afraid of two things: (1) spending the hard-earned money (2) having to redo something I don’t like and spending even more money and/or time. It’s easier for me to DO when it’s a smaller project where ANYTHING will be an improvement. I want to update my powder room, and it feels doable. But I have been putting off replacing my downstairs flooring because I know it will be costly and a big mess. Oh, I love the sink you picked! It’s just what I was thinking when you described it. I’m off to look at your former home. My bathrooms are in a really bad shape. I think you are going about it in the right way; look, compare, research and read. I just read an article on a couple building their $200,000 vacation house (plus land which would be a pretty penny in their area) and got to the kitchen and had only $2,000 to spend. They bought the most reasonble priced appliances, no upper cabinets (my next kitchen will be like that), and Ikea for lights, lower cabinets, Ikea door handles for cabinet handles (cheaper than true cabinet handles) and watching Overstock.com for lighting and deals on anything. I also believe that if you see it and think it might work, get it. You can always sell it later. Also, Habitat Re-Store is my go-to first on the list.